Organized and curated by Rebecca R. Hart, Vicki and Kent Logan Curator of Modern and Contemporary Art at the DAM, Jordan Casteel: Returning the Gaze will feature larger-than-life portraits that depict individuals from her immediate community. The exhibition will bring together a body of work, nearly 30 paintings, made from 2014 to 2018, revealing Casteel’s evolving practice and a shift in subject matter ranging from cityscapes and subway scenes to women and local business owners. Debuting on Free First Saturday, Feb. 2, 2019, Jordan Casteel: Returning the Gaze will be free for all museumgoers to see on opening day. The exhibition will be included in general admission throughout its run and free for youth 18 and under. A fully illustrated exhibition catalog, Casteel’s first solo publication, will be available in The Shop at the Denver Art Museum and online by spring of 2019. The approximately 150-page catalog will feature a lead essay by DAM curator Rebecca R. Hart and new scholarship addressing portraiture, brotherhood, visibility and place by scholars Isolde Brielmaier and Greg Tate. 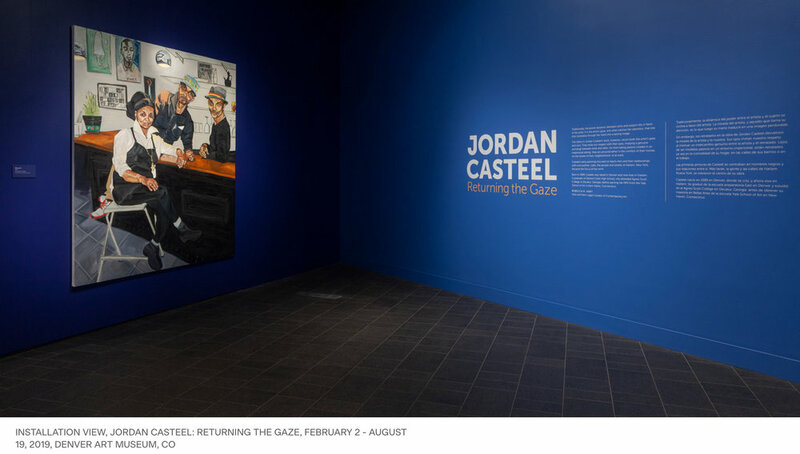 EXHIBITION SPONSORS Jordan Casteel: Returning the Gaze is organized by the DAM. It is presented with generous support from Vicki and Kent Logan, Judi and Joe Wagner, the donors to the Annual Fund Leadership Campaign and the citizens who support the Scientific and Cultural Facilities District (SCFD). Promotional support is provided by 5280 Magazine, CBS4, Comcast Spotlight and The Denver Post. JORDAN CASTEEL (b. 1989, Denver, CO) received her BA from Agnes Scott College, Decatur, GA for Studio Art (2011) and her MFA in Painting and Printmaking from Yale School of Art, New Haven, CT (2014). Using her own photographs as a source, Casteel paints life-size portraits of African American men and women in domestic environments, street scenes and places of business. Casteel’s subjects are known to her, whether familial, from her local community in Harlem, New York, or newly acquainted through the process of sitting for a photograph. Within each composition, line and gesture are treated with immediacy indicative of her process. Drawing from personal experience and larger cultural truths, background and foreground conflate with the personal narratives of her sitters. In recent years, Casteel has participated in exhibitions at institutional venues such as Crystal Bridges Museum of American Art, Bentonville, AR (2018); the Harvey B. Gantt Center, Charlotte, NC (2017) (solo); The Studio Museum in Harlem, New York, NY (2017 and 2016); MASS MoCA, North Adams, MA (2017); Boston University Art Galleries, Boston, MA (2017); The Cantor Arts Center at Stanford University, California (2017), Harvey B. Gantt Center, North Carolina (2017), HOME, Manchester, UK (2016); University of Denver School of Art (2016); and Kenyon College, Gund Gallery, Gambier, OH (2015). Casteel has been an artist-in-residence at Yaddo, Saratoga Springs, NY, (2015) Lower Manhattan Cultural Council Process Space, Governors Island, NY, (2015), The Studio Museum in Harlem, New York, NY (2015), and The Sharpe-Walentas Studio Program, DUMBO, NY (2016). From 2015 to 2018, Casteel’s work has been featured in publications such as Artforum, The New York Times, Flash Art, New York Magazine, Vogue, i-D Magazine, FADER, Time Out New York, The New York Observer, Interview, The New Yorker, and Elle Magazine. She is an Assistant Professor of Painting in the Department of Arts, Culture, and Media at Rutgers University - Newark. Casteel lives and works in New York.